Just heard that Andy Jackson and Tara, one of our star CAP clients, are being interviewed tomorrow morning (25th September) between and 7am and 8am on Radio Berkshire talking about the work of CAP. Radio Berkshire do have an archive feature on their website so you may be able to catch it later if you miss it live. Ties in well with Sunday morning when we're going to be looking at the issue of debt and hearing a story from a couple who worked with CAP and are now debt free - how cool is that! I'm speaking at Alpha tonight. We had 17 guests last week (plus 6 on the daytime course) so hopefully they'll all be back with some additions. On Sunday morning I talked about a key spiritual principle of us doing life well is to create 'headroom' in our lives so that we have spare capacity when God calls us to do something extra. I was primarily talking in the context of our finances. That if our income all gets spent on us and living for today then there is no space in our finances to do anything else and it's quite likely that money is our master. Having headroom in our finances allows us to tithe (more on that in two weeks time when we look at what the New Testament really says about tithing). Having headroom allows us to help people in need. Having headroom stops us getting into debt when unexpected expenses come along. Having headroom allows us to give beyond our tithe. Often we think our income isn't big enough to give us any headroom, but it's rarely the income that's the problem. More often our out of control expenditure. That "where did it all go" question when there's too much month left at the end of the money. We'll talk more next week about creating headroom, but one key is the biblical principle of 'first fruits'. Of deciding first what we want our headroom to be and then shaping our lifestyle and expenditure around whatever is left. But headroom also applies in other areas. It has huge implications for us with our time. I'd suggest that the vast majority of us are just too busy, and the lack of headroom in our time prevents us doing the things God really wants us to be about. It's Rick Warren who says that we can learn as much from studying the stops of Jesus as the steps of Jesus. Jesus always seemed to have time for the interruptions that came into his life. Whether it was Nicodemus in the middle of the night, the woman at the well or the woman with the issue of blood. I wonder whether in the parable of the good Samaritan the issue with the Pharisee and the Levite was not that they didn't care but that they were just in too much of a hurry (Malcolm Gladwell has some interesting insights on that - look up "Good Samaritan" in his book "The Tipping Point", or listen to what I said on Sunday if you want to look into that further). So I challenge you to look at making some headroom in your life this week. Take a look at how much you've got to spend this week and decide to spend £5 less. Then think about who you could give that £5 to, or what you could buy with it just to surprise someone in your world. And decide that when you get interrupted this week, or when you feel the Spirit prompting you to make that phone call or ask that person out for a coffee, that you won't just ignore it on the grounds that you're too busy, but that you'll create some headroom to be able to respond. Just to prove Ben Pocock really has come to Bradford here he is. Unfortunately the photo isn't good enough to see the tears in Ben's eyes at the thought of us leaving him, although he's back in Bracknell next week for Steve and Eileen's wedding. We're on our way home now. It's been a superb conference, very inspiring and thought provoking. Next years conference is the 24th to 26th September if you fancy putting it in your diary and coming with us, as we'll definitely be back. 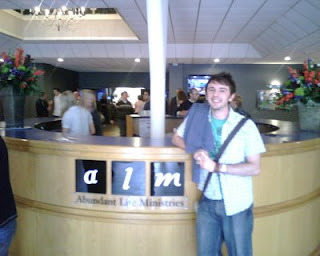 I do wish all of us could come as in many ways Abundant Life is where I think we'll be in 3 or 4 years time. Willow next, which will be great as a whole load more of us will get to experience it. I hear Ken opened the prayer meeting by saying we were all at the Larger conference! That conjures up all sorts of images but rest assured we've actually come to get stronger not larger. Apparently there are highlights on YouTube so you might be able to see some of what we've been doing there - I've only got my BlackBerry here so perhaps if someone finds the link they could post it as a comment. More today at the conference on us being culturally relevant, on being clear in our communication and on prayer. Lots of food for thought. We also took everyone on a tour of the CAP offices. 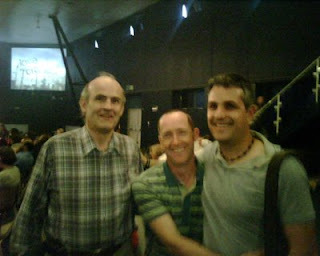 It was great to hook up with John Kirkby again - he's preaching with us on the 12th October which isn't to be missed. We're coming back home tomorrow afternoon - can't wait to see all the family again the really looking forward to church Sunday morning with part two of the money series. A great day so far, and we've still got the evening celebration to come! Lots of very good speakers but for me the highlight so far has been Paul Scanlon speaking on legacy, and how every generation needs to recognise that it builds on the legacy of the previous generation whilst still building for the future. Great to be sitting next to Ben as we reflected on how we're trying to model succession. This morning was seminars. Colin went to a media seminar and came out very encouraged with how far we've come and excited about some of the future developments we're planning such as video notices. Lee was doing some post RockNations networking and there are some exciting tie ups there in the offing for Ethos, our youth and our wider church. Others went to seminars on kids work, working with the poor and a bunch of other issues. All very exciting. It's also great to hook up again with Ben Pocock who's just started at the leadership academy here - we just want him back when he's finished! Greetings from sunny Bradford - I'm here with a team at the Abundant Life Stronger leadership conference. It's such a privilege to be able to come to these conferences, to be in meetings that I'm not leading (you can't imagine how releasing that is!) and to hear from God - especially in this phase we're in of digging some new wells and redigging some old ones. I'll try and post updates as the conference goes on. I'm also praying right now for the Alpha courses starting tonight and tomorrow morning. Let's be asking for changed lives with everyone attending. Last Sunday evening we watched a fascinating DVD of Erwin McManus speaking at a conference at Mosaic from a couple of years ago. As part of the talk Erwin got everyone to write down on a piece of paper what their favourite colour was. Why not do that right now, or at least think what your answer would be. He then got everyone into groups of 4 or 5 and asked each group, based on their individual preferences, to decide what the group colour was going to be. In my group we had 4 of us, 2 blues, a yellow (me) and a green, so our group colour was blue. He then called out colours and asked each group with that colour to stand up. He finished with blue, at which point nearly every group stood up. What happens is that although there were lots of different colours, the dominant ones tend to take over, and so yellow people and red people and pink people and green people are forced to be blue. Erwin was arguing that the same thing happens in church life, except that our colour preference is replaced with our willingness to change. Some of you may be familiar with this diagram which shows how open people are to adopting new ideas. This article explains it in more detail but the basic idea is that when something new is proposed only a very small percentage of people (the innovators) will be willing to jump straight in and give it a go. Once they've done that, and demonstrated some level of success, then a larger number of early adopters will also get on board. Once the new idea has taken hold in this group, and begins to demonstrate real benefit then the early majority will be willing to sign up. Much later will come the late majority, who will resist the change for as long as they can until it becomes inevitable, and finally the laggards who fit that old joke "How many baptist ministers does it take to change a light bulb ---- change, who said anything about change!". You can think of anything new in these terms, just think of the adoption of the mobile phone which now even the laggards are beginning to admit may be of some limited use. Most churches are made up of early and late majority people, which means that even where there are yellow innovators, they get swamped out by the blue majority. That's why churches can be very resistant to change and very stuck in doing things the way we've always done them. First of all to perhaps help you understand me as a leader a bit better. I'm a yellow innovator / early adopter. That's why I've nearly always worked for small start up companies, and why as a leaders I'll always be encouraging us to try new things, even if there's no absolute guarantee that they're going to work. I think that's often how God's kingdom moves forward - think Jonathan and his armour bearer or Joshua and Caleb out of the 12 spies - there were some top late adopters in those other 10 spies! But there are some dangers in being an innovator, and that's why it's so exciting and reassuring to have lots of wise heads around me who keep all of this rooted. That also makes me so grateful for people around me with the gifts of wisdom and administration and a whole load of other things who can take ideas and turn them into reality (just think of team of people like Ruth Buxton, Colin Boyle and Scott Allen who turned the dream of Hope08 into a reality). Secondly to say that our history as a church is a history of being a bunch of innovators and early adopters. Ditching democracy for a leader lead church, building The Kerith Centre when building big buildings was thought to be madness, gathering one large church when the perceived wisdom was to split into multiple congregations and many others. So if there's anyone to blame for us being a risk taking bunch it's Ben, not me! Thirdly to encourage all of us to embrace change as part of our future. As the church in our nation if we aren't willing to change and adapt we will die. Sometimes as we change there will almost certainly be things we get wrong or overlook. At those moments choose to be part of the solution, and think "what could I do to fix this? ", rather than just being part of the problem (if you know what I mean, with my most pastoral of pastoral hats on!). This will be particularly true as we transition to our three meetings from January next year. We'll probably get most of it right but never all of it. And finally to say that we are never to be a church with one dreamer and many workers, but a church with many dreamers. The prophet Joel says of the coming age of the Spirit that "your old me will dream dreams". Let's all be risk takers, working out the dreams God has placed in our hearts. With yesterdays news of the collapse of Lehman Brothers it seems very appropriate that we started our six week money series only the day before. You can listen to the podcast here if you missed it. As part of Sunday I recommended a couple of books which I thought would help people in their understanding of God and how we can feel confident letting him into every area of our lives. 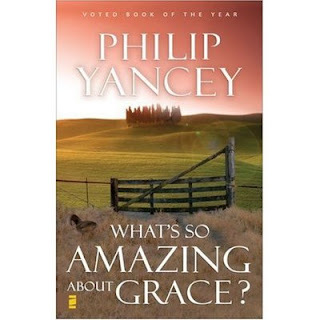 The first book was "What's So Amazing About Grace?" by Philip Yancey. When I first read it a few years ago now it was genuinely life changing in terms of my understanding of the nature of God and the nature of grace. I reckon it should be compulsory reading for anyone calling themselves a follower of Christ. The second book is one that I bought last Friday and finished on Sunday afternoon. 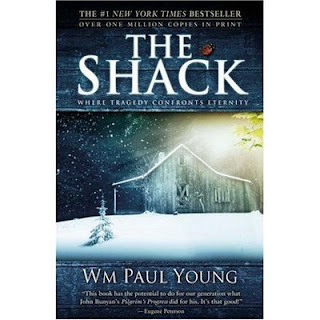 It's called "The Shack" and although told through the story of a family tragedy is really about how we relate to God and He relates to us. I did enjoy it, and would encourage people to read it, but would have a caution that we need to take the view of God it presents and make sure we test it against what God has revealed to us through scripture. Not that I necessarily think that any of what is has to say is wrong, but that we need to be mature enough to take all things that come to us, whether it's "The Shack", Harry Potter or the adverts on TV and let the Bible be our ultimate benchmark of truth. I'll say no more. Whilst on the subject of books several people have pointed out to me that I haven't updated the list of books I've recently read on my blog since it first started. That isn't because I'm not reading anything but because I'm lazy! Just to let you know I'm currently reading a book on the nature of faith by the guy who headed up the Human Genome project, and who also happens to be a Christian. It's fascinating. I feel a series, or at least a sermon, on how we put together the whole Genesis creation story, evolution, Intelligent Design thing together in a way which keeps us true to scripture but also doesn't require us to leave our brains behind at the door. Anyone up for that? I did mention this earlier in the year but it may well have got lost in the excitement of the Summer! On the weekend of the 23rd to 25th January 2009 we have the opportunity to go to Butlins together with the other Newfrontiers churches in our region for a weekend of fun, an opportunity to hear from Terry Virgo (the founder of Newfrontiers) and David Stroud (who heads up Newfrontiers in the UK), to worship together and to generally have a good time. Lee, our youth band Ethos and our youth team are also going to be heading up the youth work with over 600 young people expected to be there. I mention it now for two reasons. First of all there is a price increase if you book after the 29th September. Secondly I heard this week that of the 3,500 places available there are only about 1,000 left - so if you want to go it would be a very good idea to book now. There are brochures with more details available in reception - the booking line is 0845 070 4772 if you want to book straight away. Just to be clear I'm not by any means expecting everyone from Kerith to go. In fact that weekend will only be our third week of doing two morning meetings so if everyone does go we'll be in deep trouble! But if you fancy going and can afford it then I think you'll enjoy it. There is an £80 refund if you serve. If you want to serve with the youth please chat with Lee before signing up to make sure he'll have something for you to do. Hope to catch lots of you this weekend as we start our six week series on money. I've been back from our France holiday for two weeks and a day today. It's amazing what you can fit into two weeks! First of all Hope08. What an amazing event. 52 different social action projects taking place over the course of the week ranging from befriending to gardening to playground painting to packing peoples bags at Tescos. Then Hope in the Park where the Miracle Street guys who supplied the stage estimated the overall attendance at somewhere between 3,500 and 5,000. The weather was a miracle itself in that we must have had the best days weather in the whole of August - an answer to prayer in itself. The Church in the Park on the Sunday, where unfortunately the good weather didn't quite last! There were so many positives to the week. Churches in Bracknell working together for the most meaningful way in decades. Thousands of people who wouldn't normally go anywhere near church being served and enjoying an event which wasn't some sad christian do (you know what I mean) but a well run, well organised event which honoured God. A number of salvations and people signing up for Alpha courses (I'd always long for a much bigger thing, but we're told not to despise the day of small beginnings). And a real sense of us not being afraid to declare Jesus and own his name in a very public way, outside the walls of our buildings. Yes there are lots of things we will do differently if and when we do it again, but lets take time to stop and thank God for the amazing things he has done. 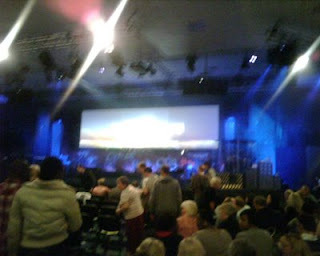 Then last Saturday I went with BenD to the Tearfund "Who Is My Neighbour" Conference at Jesus House in Brent Cross. Nicky Gumbell, Pastor Agu (who leads Jesus House) and Lynne Hybels all spoke really well on motivating the church to engage with the issues relating to global poverty, but for me the highlight was hearing Archbishop Desmond Tutu speak. He was so funny and so down to earth, yet at the same time so profound. For someone who is a Nobel peace prize winner, and who was so instrumental in the whole process of the dismantling of the apartheid system in South Africa without the country descending into a bloodbath, it was amazing to hear him making jokes about "fluffy little lambs" as he unpacked the story of the shepherd who left the 99 to reach the 1. Then this Sunday morning just gone to have Lynne Hybels there to launch our HIV and AIDS initiative in Serenje, Zambia, was a real privilege. 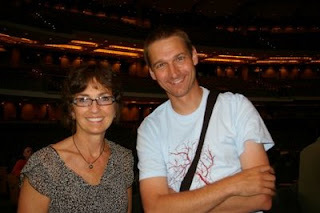 If you missed it then I really encourage you to listen to the podcast of her talk. As I said on Sunday we're going to be having two gift days on the 18th and 25th October, aiming to raise £100,000 to cover the costs of the first year of the project. Pick up a leaflet at reception if you want to read more details about the project and consider what you might give (hopefully we'll get all the details up on the website soon too, as well as the facility to give online). I'll be posting some more on the things coming up later this week. Lynne Hybels, wife of Bill, is in the UK this weekend and I'm going to have the privilege of hearing her twice. First of all on Saturday she's speaking at the Tearfund "Who is my Neighbour" conference in Brent Cross, alongside Desmond Tutu. If you fancy coming along it's from 2.30pm to 7pm in Brent Cross - it's free to get in but you do need to register online. BenD and I are both going - should be great. Then on Sunday morning she's going to be at The Kerith Centre for the launch of our HIV and AIDS initiative in Zambia. A morning not to be missed. On Sunday night I'm going to be talk in more detail about what we're doing in Zambia, as well as commenting a bit further on what has happened with Todd Bentley and Michael Guglielmucci. I should also mention that our very own Lisa Rutland was on Sky TV last night for an hour talking about Christians Against Poverty. It was on Revelation TV and apparently is going to be repeated, although I couldn't find any times for that, or any copies of it on the web. Perhaps someone could post dates and times or links if they find any. All who saw it have said that Lisa did really well - what a star. And finally to say that Andrew White was interviewed by Michael Burke on Radio 4 tonight. I didn't hear it (we had an elders meeting), but this seems to be where the programme will be archived, although it isn't there yet. Hope at least some of that interests you. I'll be writing some comments on the amazing time we had at the weekend with Hope in the Park some time soon.